I admit it. This morning I cried. I’m in Boston for the New England Crime Bake, a great mystery conference coming up this weekend. I came to Boston early so that I could experience this place that, in so many ways, is the birthplace of American democracy. 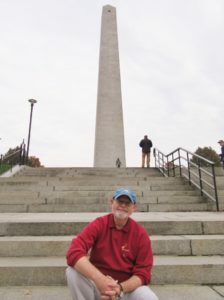 Today, I walked the Freedom Trail, which ended at Bunker Hill. Here I am at the foot of the memorial to that bloodiest battle of the Revolutionary War. When I read about the men who stood here, shoulder-to-shoulder, facing overwhelming odds because they understood that to die in defense of freedom was a noble thing, I wept. It’s fitting that I’m here this morning. We have just come to the end of another hard-fought battle that, in its way, is a tribute to democracy. The reins of our government will soon be handed over in a bloodless exchange that, though not all may agree with, all should be willing to abide by, because the majority in this democracy has spoken. Who we voted for yesterday is irrelevant now. The decision has been made. If we, all of us, truly believe in this way of government secured for us by those who stood ready to die on Bunker Hill, we will join together in unity. What has been a divisive period can now become, if we work with true hearts toward this end, a time of reconciliation. I can’t help but feel that we stand on the threshold of a new political period, with incredible challenges ahead. I would like to believe that we can put aside rancor and stand shoulder-to-shoulder once again. What comes at us up the hill may not be the enemy of old. It may be the necessity of looking at ourselves and our world in a different way. It may be accepting some cold realities about the disillusionment of a great many of our fellow citizens and a government that often seems to serve its own self-interest above the interests of its people. There’s plenty of reason to wring our hands and cry that the end times are near, but that’s the easy response. We are Americans, all. We have come from people who, at Bunker Hill and so many places like it, risked everything to defend the dream of a democratic nation. It seems to me time once again to roll up our sleeves and get down to the hard work of shaping a future. We can simply stand back and let others do the shaping and complain. Or we can take our place in this democracy, work within the guidelines a pretty good document called the Constitution of the United States, and find ways together to solve the problems that threaten us all. We don’t always have to agree with one another. But we should always do our best to respect one another. And so I say with a full and hopeful heart on this day after a democratic election, God bless America.